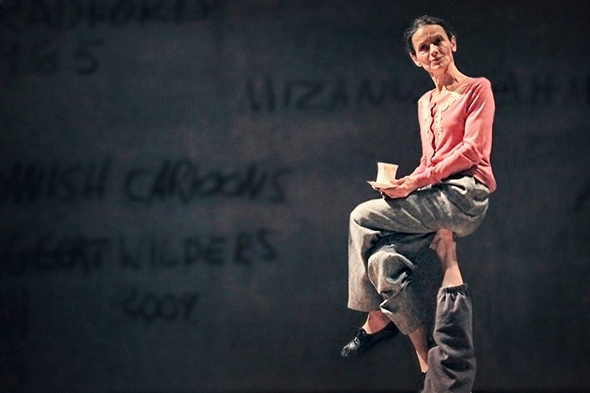 Posted: June 4th, 2012 | Author: Nicholas Minns | Filed under: Performance | Tags: Amartya Sen, DV8, Islam, Lloyd Newson, Multiculturalism, Theo Van Gogh | Comments Off on DV8 Physical Theatre: Can We Talk About This? In the Corn Exchange in Brighton it is oppressively hot. The stage could be a classroom or lobby with parquet flooring and a partition wall (that swings back later to open up the entire stage area) of twelve mirror squares and a door. A section of the front four rows of the audience is reflected in the mirrors as we wait for the show to start, fanning ourselves with DV8’s large 25th anniversary program. The door opens in the dark, and when the lights come up we see a character doing a handstand against the wall asking us: “Do you feel morally superior to the Taliban?” This is the opening salvo of what creator and director Lloyd Newson calls ‘a verbatim theatre work investigating the interrelated issues of freedom of speech, multiculturalism and Islam as manifest in Western democracies.’ Verbatim theatre means that the text of the performance is based on archival material and interviews with prominent people who have had first-hand experience of these themes in this country and in Europe. The experience of these prominent people spans the period of multicultural policy from the forced resignation of Bradford school principal Ray Honeyford in 1985 to the present. We are told the question in the title may have come from Theo Van Gogh, the Dutch filmmaker, when confronted by his Muslim assassin. The doctor who carried out Van Gogh’s autopsy thinks it improbable he would have had the time or the breath to say anything, so perhaps it is a myth, one that Newson maintains nevertheless in deference to Van Gogh. For those who saw the last DV8 production, To Be Straight With You, the format of Can We Talk About This? is familiar: quoted speech delivered by the cast in a choreographed, gestural format, with archival film material and a classroom board on the back wall on which relevant names, dates and figures are scrawled: a format that is as much documentary as physical theatre. In these examples and throughout the performance, the level of artistry and commitment of the dancers is superb. With 25 years of making visually striking, often controversial physical theatre, in which the message is bound up in the imagery, there is a sense in Newson’s two most recent works that he wants to undress his message and put it centre stage; that in Can We Talk About This? we are in effect in the (stiflingly hot) church of DV8, listening to Newson in the bully pulpit. There are two problems here: firstly, there is a self-righteousness that permeates the sermon; whether or not it is intended, it is easy to come away from the densely argued performance with the impression that Islam is a force for evil that is encroaching on our freedoms. Given England’s legacy of colonial interference in the Middle East, there is an irony here that Newson simply waves away as an irrelevant distraction. It serves him well to start his story in 1985, but the history of multiculturalism in England has its roots from well before then and they have to be taken into account. The second problem is that by associating all Muslims with the fanatics, Newson is in danger of polarising his argument into an equally fanatical stance. An essay entitled Violence & Civil Society by Nobel Laureate Professor Amartya Sen, a fellow and former master of Trinity College, Cambridge, addresses the basic issue of how to defuse tensions in a potentially violent, multicultural society: “The first challenge is to overcome confused and flammable readings of the world. While we human beings all have many affiliations – related to nationality, language, religion, profession, neighbourhood, social commitments and other connections – the cultivation of group violence proceeds through separating out one affiliation as someone’s only significant identity.